Griffworks wrote: Did you ever get him repaired? I'm hoping so, as this was a sweet build. Not as yet. I did do some patching with Perfect Plastic Putty (PPP) and glued the shell back together. I'm trying to figure out how to sand and finish smooth without damaging too much of the Bird's tail. 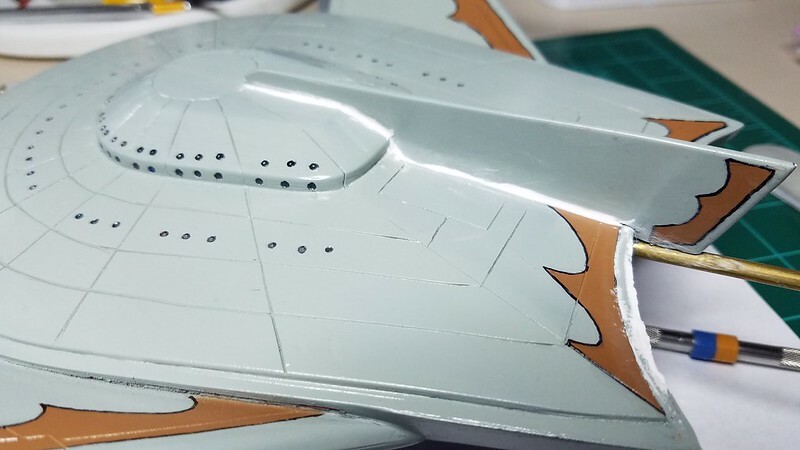 I will also have to think how to repaint the hull color without having to repaint the bird, too. But I have made some headway on the Ent C and may even have time to pick this one up again before my Big TOS E project! Thanks for looking and asking! Oh man. 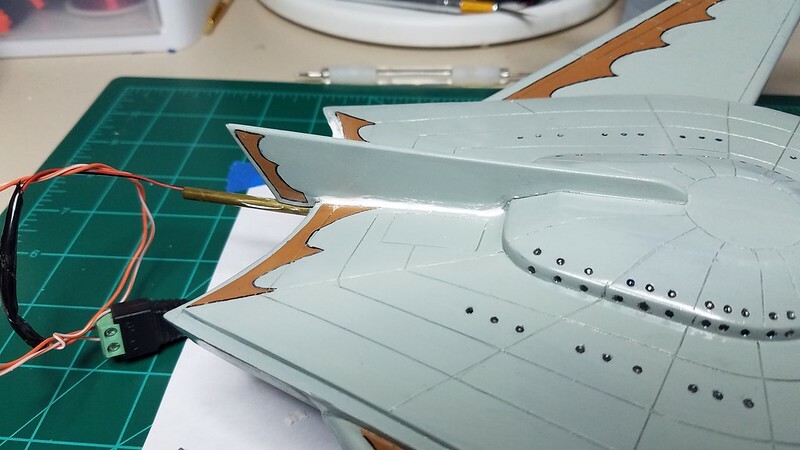 You will love how the Big TOS E fits together after all your travails with this ill-fitting bird! I figured I would, trekriffic! I have heard nothing but good things about this model and I am getting excited about building it! I have made some headway on the repairs. 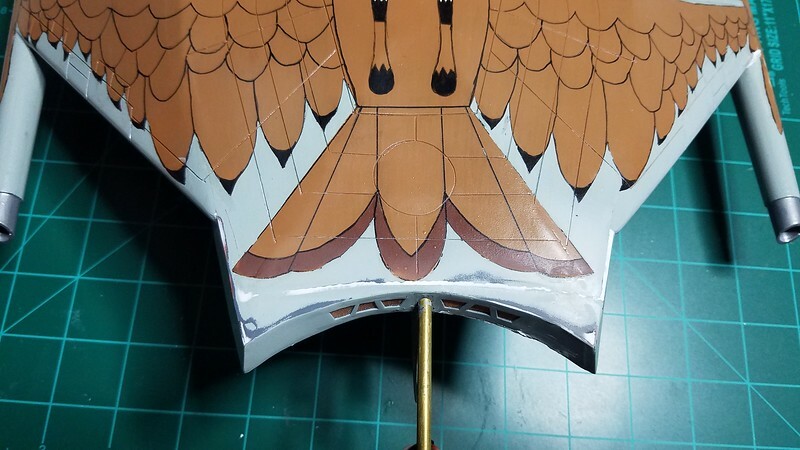 Since I am applying paint and putty to the C and, since I had the materials out already, I would go ahead and apply them to the Bird, too! I used some masking tape for the vental repair to control where the putty "went". I didn't want to have to repaint the bird of prey if I didn't have too. Here is a shot after sanding it down a bit. It feels smooth to the fingernail, so it should be ready to accept paint. I also sanded this down once but wasn't happy with the look, so I added some more material and am waiting for it to dry. 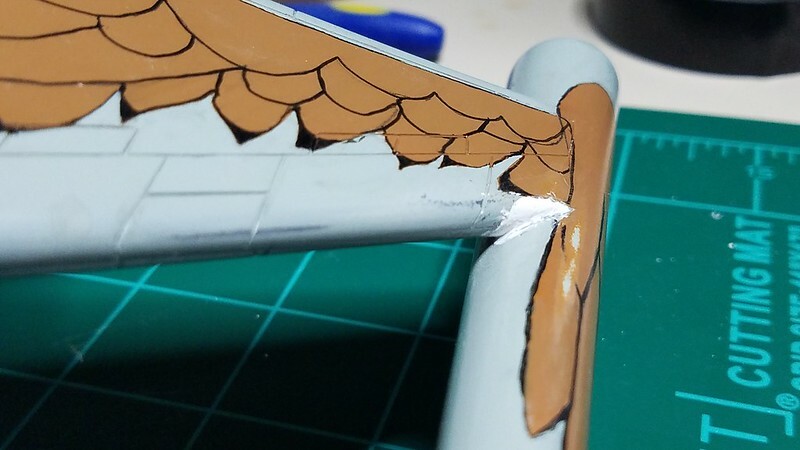 I put the tail fin back on and filled the cracks with Perfect Plastic Putty. Here is a tip, you may already know this, but, since PPP is water based, I used a moistened make-up foundation applicator sponge to clean up and smooth out the PPP. This should leave me with less sanding or shaping to do; at least that's the theory. Once I have done the shaping and sanding, I am going to have to think through how to mask it out and repaint with minimal overspray so the markings would be so difficult to repair! As always, thanks for looking and commenting! Good luck wit hthe fix. Having something like that broken is heartbreaking. Thanks for showing this adventurous (spills and all) build log. It's rebirth will undoubtedly be a work of art. Looking forward to its comeback. Thanks, Pantos! My "Honey-do list" has overwhelmed my bench time so progress is slow going, Im afraid. Thanks for the interest! I hope to post more soon! ... My "Honey-do list" has overwhelmed my bench time so progress is slow going, Im afraid.